How much longer are you going to contribute to the culture of death and be part of the secular parishes that are actively trying to dismantle the Catholic Church from within ? Whenever we mention any organization or entity in a negative light however true it must, by requirement, be accompanied by double the amount of prayer for same. The Orchestra of “The Church of the Ascension” an Episcopal Church on 5th Avenue and 10th Street will present a Fauré Requiem on Thursday evening on February 5th @ 8:00pm in the Russian Orthodox liturgical tradition ! Dozens of Stories Continue To Appear Each Week On Heretical Words and Concepts From the Pope – What Does It All Mean? Is that “something else” a Pope that that has come to deceive the people and complete the groundwork that was previously laid for the creation of a new syncretism religion? In the event the Pope becomes a heretic we have previous precedents, infallible teachings and an indult to go by. Most of which can be retrieved by archive sites even when made into the status of “no longer available” Some examples from Vatican archives sites are below. But this is not enough. Gregory rebukes the bishop who, through love of spiritual solitude and prayer, fails to go out into the battlefield to combat strenuously for the cause of the Lord: “The name of bishop, which he bears, is an empty one.” And rightly so, for men’s intellects are to be enlightened by continual preaching of the truth, and errors are to be efficaciously refuted by the principles of true and solid philosophy and theology, and by all the means provided by the genuine progress of historical investigation. It is still more necessary to inculcate properly on the minds of all the moral maxims taught by Jesus Christ, so that everybody may learn to conquer himself, to curb the passions of the mind, to stifle pride, to live in obedience to authority, to love justice, to show charity towards all, to temper with Christian love the bitterness of social inequalities, to detach the heart from the goods of the world, to live contented with the state in which Providence has placed us, while striving to better it by the fulfillment of our duties, to thirst after the future life in the hope of eternal reward. But, above all, is it necessary that these principles be instilled and made to penetrate into the heart, so that true and solid piety may strike root there, and all, both as men and as Christians, may recognize by their acts, as well as by their words, the duties of their state and have recourse with filial confidence to the Church and her ministers to obtain from them pardon for their sins, to receive the strengthening grace of the Sacraments, and to regulate their lives according to the laws of Christianity. at St. Anthony of Padua Oratory, West Orange there will be a Solemn High Mass @ 7:00pm with celebrant Rev. Cyprian LaPastina and guest homilist Rev. Frederick Miller. Father Miller is the spiritual director of the Seton Hall seminary and is known to EWTN audiences for his series on the spirituality of St. Francis de Sales and on the priesthood of Jesus Christ. His latest book, “The Grace of Ars”, is about St. Jean-Marie Vianney and is published by Ignatius Press. On Sunday February 1st @ 10:30am a Traditional Mass will be offered celebrating the 114th Anniversary of the Consecration of the Altars of Holy Innocents, New York City. Two of whose side- Altars were destroyed in the 2nd iconoclast movement of the Catholic Church, that took place through the 1970s – The original etched marble High Altar is extent, fully restored and is the center of the revived Old Rite in midtown Manhattan ! All the Met’s El Greco paintings plus several on loan from the Hispanic Society of America will be shown together. These include some religious works based on the New Testament. Hours: Sunday-Thursday, 10 a.m.-5:30 p.m.; Friday and Saturday, 10 a.m.-9 p.m.
Well despite the beautiful and acceptable variations such as The Little Office of the Blessed Virgin, Mary, The traditional Roman Breviary, the four Volume set of the LOTH, and Christian Prayer- “Christmas/Epiphany Season” goes to the 2nd Vespers of the Purification of the Blessed Mother where the blood of two slaughtered turtle doves are offered for the Purification of the Blessed Mother in her return to the temple as the child Jesus our Savior is presented to the High Priest Zachariah as prepared by Ana the temple’s prophetess and Her Heart and Soul are also prepared for the Sacrifice and for “the change” of the Temple – 02/02. “Neither do men light a candle and put it under a bushel, but upon a candlestick, that it may shine to all that are in the house. 16So let your light shine before men, that they may see your good works, and glorify your Father who is in heaven.17Do not think that I am come to destroy the law, or the prophets. I am not come to destroy, but to fulfill. 18For amen I say unto you, till heaven and earth pass, one jot, or one tittle shall not pass of the law, till all be fulfilled. Having attended myself some of their monthly gatherings several years ago at their regional location in Yonkers as well as having attended their annual NYC three day gala or parts thereof for three years running this year I said no more. I chose not to attend this year solely from having watched the metamorphosis of their “raison d’etre “. Seeing them single handily change within this organization, to include the young people that continue to follow it in 100% acquiesce to both it and their increasingly socialistic positions without questioning any of it, is reason enough. Declaring itself not only as the opposite end of Catholic traditionalism and orthodoxy but letting it be known that “it” is currently ‘in-charge. It’s rabidly anti- traditional at it’s Core-, it has partnerships with other religions and of course the new dogmatic agenda of redefinition of islam and islamic ecumenism (which is forbidden by the way by Vatican II which only refers to Christian denominational ecumenism) is a big part of it’s dogmatic push as well. Secondly it’s a new type of liberation theology, a socialism that is a form of radical egalitarianism with an unbolting of any required Christian commitments, replete with the new Catholic theology known “subsidiarity” The antithetical paradigmatic opposite ! of the infallible Catholic teachings of Quas Primas – Found here for your reference. Further, it is devoid of any noble aristocratic Catholics association with Bishophric succession whatsoever. The latter of which has been virtually discarded by post conciliar theology and modern Catholic biblical exegesis in general. Why ? Because, in their opinion, the Truth ostracizes. Protestantism and protestant social teachings, of various so called Christian forms of government, to which the progressivists wish to propagate, IS their unofficial phase 2 of vatican II implementations. At the very least it is resident within the large and growing ranking ‘party’ within the Church. Is the coming of this direction going to sanctify Romero here or “liberation theology to the forefront” or both ? What’s the connection between the new immigration policy and it’s sudden thunderous support from the USCB especially from countries like El Salvador and the changing political positions on socialism and religious partnerships of ideology?! An expose on prophesy vs. prediction, which is two very different things is highlighted this morning on the Catholic Journal Crisis magazine and is well writen. Catholic Churches are by far majority in the shape of a Cross and the Sacrifice is offered at the head for many reasons. – Highlighting just a few, we have to the left and to the right the thieves ( the acolates) at the nails that serve the hands of the Lord ( and/or in many other places the Mother and Father of our Lord to either side) , the Holy Tabernacle of the Body is at the top in the center surrounded by thorns, (which is why every progressive Priest wants it moved out of the center of the thorns) crys of sorrow, chants, and songs of worship come up from the feet of the Crucifix overhead of the crucifix and never just a Cross are always signs, symbols, or letters telling of who “He” is. New Jersey’s first official hero ! As with all authentic Catholic books we first look for a pre-concilar dated Nil Obstat and Imprimatur stamp and signatures as we all know that there are more post conciliar Nil Obstat and Imprimatur stamps and signatures on heretical books that you can shake a stick at – For the record you cannot find one written prior to the internal Church revolution of the 1960s with these two stamps that deviates from the Truth one Iota – it’s impossible. As there were indeed more ups than downs – The Philippines witnesses to a mass testimony of Faith to the world of Catholic power & unity with the fifth largest gathering in human history broken only in records set in the mother lands of Poland is experienced and reverberated in more than just Catholic circles. 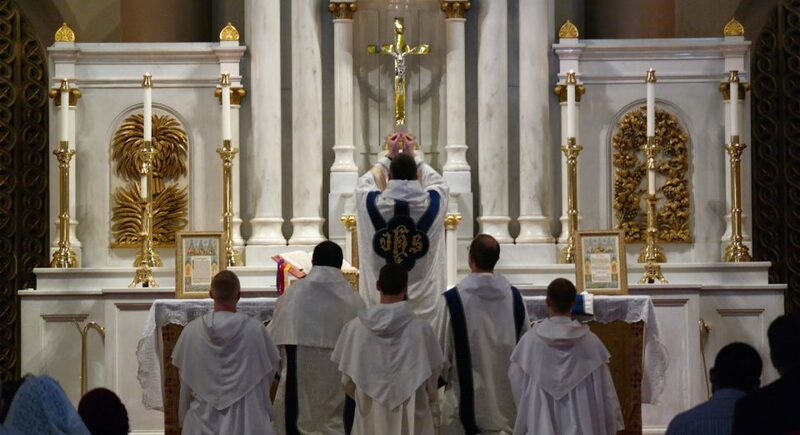 We are therefore able to look the other way at some of the other egregious events that took place such as the video captured of wide-spread liturgical abuses at the Pontifical Mass as lay people re-redistribute multiple Holy Communion to other lay people behind them in the hand like handing out leaflets and others pass Our Lord in their hands to others behind them. I watched two of the Masses beside Filipino people that spoke Tagalog and they did not understand one word of the lay prayer devotions of the Mass – in their own country- with multiple dialects represented one after the other with the majority “not” understanding what was prayed or said. Trying hard to find the upsides and the unity His Holiness established via sui juris status a new Metropolitan See for the Eritrean Catholic Church the Pontiff approved we celebrated including the rule to preserve it from the new Rite. Giana Center provided teachings that were so heretical that my wife and I had to walk out of the seminars in progress in NYC in protest. Literature was instead distributed en masse about climatization as a greater evil. Look at their upcoming events …A professor speaks on how “the COMMONALITY of religions” leads to peace…..
1Cor 6 14Bear not the yoke with unbelievers. For what participation hath justice with injustice? Or what fellowship hath light with darkness? 15And what concord hath Christ with Belial? Or what part hath the faithful with the unbeliever? 16And what agreement hath the temple of God with idols? For you are the temple of the living God; as God saith: I will dwell in them, and walk among them; and I will be their God, and they shall be my people. 17Wherefore, Go out from among them, and be ye separate, saith the Lord, and touch not the unclean thing: 18And I will receive you; and I will be a Father to you; and you shall be my sons and daughters, saith the Lord Almighty. Go out from them and be ye separate ! Not just in the Old Covenant but in the new it say again Go out from them and be ye separate ! On our weekend there in upstate NY writing up to three pages of abuses that would stagger any engaged pre-cana couple it included permitting couples to do question answer sessions on each other’s beds in each others rooms !